I am sure by now that you are aware of the allegations of police brutality against demonstrators during the G20 last week. This week, enough evidence has come to light surrounding the death of Ian Tomlinson that an independent inquiry has been launched, a fact for which I am very thankful. I remain concerned, however, that the case of Ian Tomlinson's death may drown out the other incidents which took place on April 1 and 2 2009. This case has already demonstrated the willingness of the Metropolitan Police and the IPCC to cover up the truth. 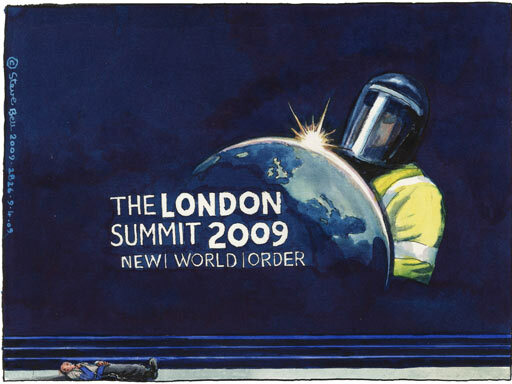 http://www.guardian.co.uk/uk/2009/apr/09/g20-police-assault-ian-tomlinson-g20 provides a good summary of the many attempts by the police to close down the investigation, prevent crucial evidence from being published, and deflect blame away from themselves. Since the protests last week, eye-witness accounts have flooded online media with convincing and consistent reports of police brutality. The tactic of kettling protesters has already, quite rightly, been publicly questioned. Batons and shields were used aggressively against peaceful protesters inside the Bishopsgate kettle on April 1. Even police medics joined in the fray, enthusiastically hitting demonstrators with full-arm swings from a position of safety behind police lines. Around midnight on April 1, teams of baton-wielding riot police with dogs were sent to clear hundreds of peaceful protesters from the climate camp in Bishopsgate while the national media was absent. Not only were demonstrators injured and intimidated, but the police wilfully destroyed their personal property - a particularly hypocritical act given that the police used the vandalism of RBS by protesters to excuse police actions earlier that day. Contrary to the narrative presented by most national media, most protesters were peaceful, and the police response was violently disproportionate. I have been appalled by the biased reporting of this case in the BBC and other national media, which I assume can only be the result of police pressure. I am concerned that this suppression will allow the bigger picture of police conduct and strategy to go unchecked. I hope that justice is met regarding Ian Tomlinson's death, and that not only the individual officers, but also their superiors, will be brought to account. I also hope that the countless incidents of unprovoked police brutality against hundreds of peaceful demonstrators will be publicly accounted for. Ian Tomlinson was not the only innocent person to be assaulted by police, and the survivors of aggressive policing deserve justice as much as the victims. I urge you to raise this matter in the House of Commons, and put pressure on the police for an independent inquiry into the wider issue of police conduct and strategy during law-abiding demonstrations. Police should enable peaceful protest, not impede it. The strategy of kettling is more likely to cause violence than contain it, and the use of riot shields and batons against peaceful protesters is unacceptable. Many people in this country are unhappy with recent decisions made by this government, and have legitimate fears for the future. Personally, I am concerned by a pattern of increasingly repressive legislation curtailing our civil liberties and personal agency. In a party system our power to effect change is limited, and public demonstration remains one of our best options for making our voices heard. If exercising our democratic right to protest results in us being intimidated, unlawfully detained, and physically assaulted, then this country is more police state than democracy. Sent via Write to them. Given David Lammy MP's track record, I'm not particularly confident that he'll speak out on this, so I've also sent letters to Baroness Miller of Chilthorne Domer and Lord West of Spithead, who debated the use of force against protesters before the G20 last week. I've also signed this petition against the use of kettling at peaceful demonstrations. And I'll be at the Memorial Protest tomorrow.